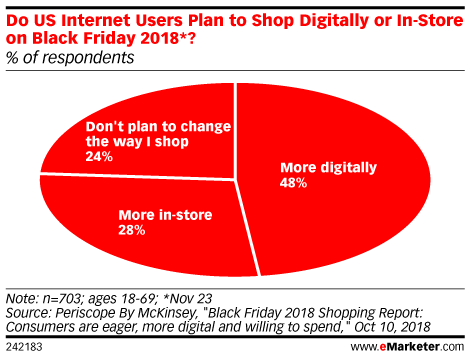 Data is from the October 2018 Periscope By McKinsey "Black Friday 2018 Shopping Report: Consumers are eager, more digital and willing to spend." 2,522 internet users ages 18-69 in Canada (n=507), Germany (n=505), the UK (n=509) and the US (n=1,001) were surveyed online in September 2018. The survey samples were equally weighted between female/male respondents in all countries. Periscope By McKinsey provides a suite of marketing and sales analytics solutions.